Jewelry: 1910 - 1939 Art Deco. 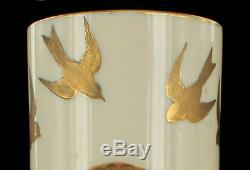 Antique Owl Bird Scene Custard Art Glass HP Cylinder Vase Pr 11 Mt. 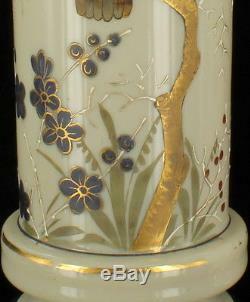 Antique Custard Art Glass Handpainted Owl Bird Scene Cylindrical Vase Pr 11 Mt. Custard, light white base glass composition. 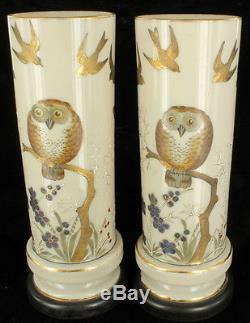 Neat shape shows a thin and tall top half decorated with a distinguishable perched owl design. 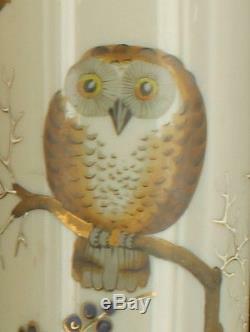 The owl is resting on a gilded tree branch and finished in orange, brown, black, with two large yellow eyes. 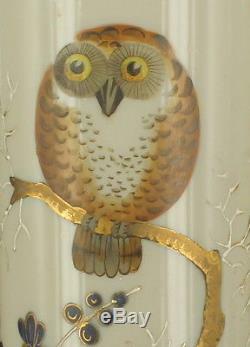 Several areas of gilded accent is witness around the central owl, namely four five additional birds, and background flower petals set at the lower rim. Thin sections of hand-painted white enamel flow out of the blue and red flower bud lower decoration. 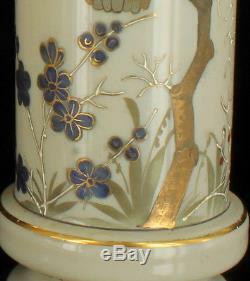 Three gilded edges set around the vase, two on the lower "pedestal" base, and one at the top rim. 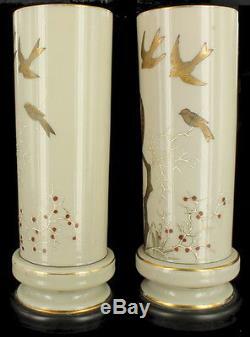 Lowest rim is finished with black paint to appear as if the vase's are elevated on a platform. Bottom base Diameter measures 4 1/4. Top Diameter measures 3 1/2. 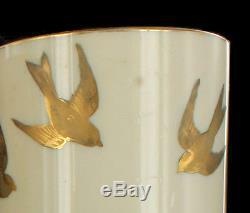 Minor rubbing/fading of the gilded trim. Some of the white enamel has worn down over the years, nothing significant. Minor yellowing around one of the lower rim. 1L #1.5 5L (RHS). 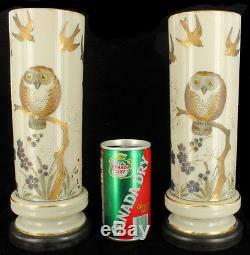 The item "Antique Owl Bird Scene Custard Art Glass HP Cylinder Vase Pr 11 Mt. Washington" is in sale since Friday, January 8, 2016.